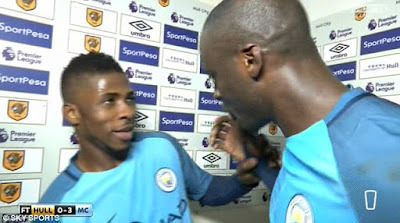 Manchester City star Yaya Toure embarrassed teammate Kelechi Iheanacho after a mix-up at the end of their win over Hull. 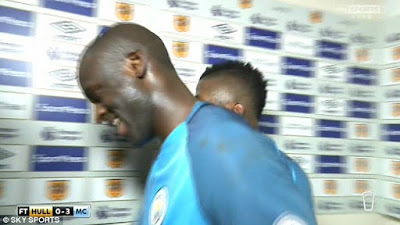 What happened was Yaya Toure was in good spirits after being named man of the match after City's win over Hull. There had been an all-action display which culminated in him scoring the first, and decisive, goal from the penalty spot. 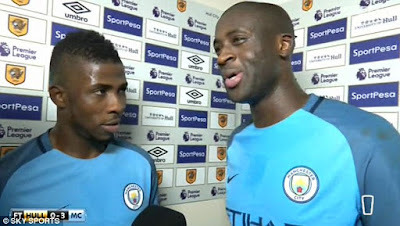 and both men seemed to be giving the TV cameras the sort of platitudes expected after a hard-fought, but expected, Premier League win. 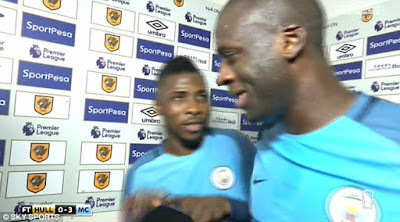 But then came the awkward moment as Toure, who had earlier in the interview mentioned that it was his son's birthday on Christmas Day, was handed the award. 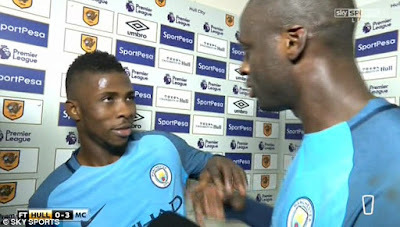 Oh nice, thank you very much, I will give it to my boy then,' said the Ivorian midfielder.Iheanacho, however, had presumably not been listening to the heart-warming tale of Toure Jnr telling his father he was destined to score a Boxing Day goal, and assumed that 'my boy' was simply a term of endearment for Toure Snr's Nigerian team-mate. 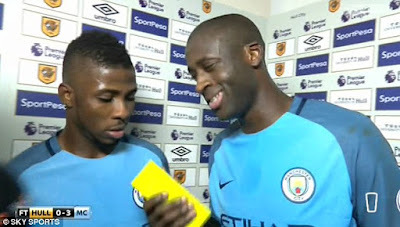 The striker reached out to take the award he thought he was being given, only for Yaya to start laughing, slap his hand away and say: 'No, it's not you, my boy!'. 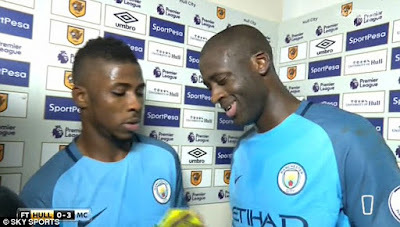 Toure than wandered off, laughing along with the interviewer, as Iheanacho looked confused and, let's face it, a little hurt.